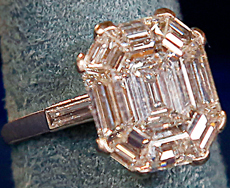 Learn more about antique engagement rings from A La Vieille Russie. And tune in to watch Mark Schaffer on ROADSHOW in Baton Rouge, February 17, 2014, on your local PBS station. Mark will be live tweeting with Antiques Roadshow from the A La Vieille Russie Twitter handle on February 17 from 8/7c-9/8c PM. Follow @RussieJewels and @RoadshowPBS and use #antiquesroadshow to join the conversation.